Greg Rucka and Nicola Scott are an exceptional creative team, and while working together on their creator-owned Image series Black Magick, they developed a strong chemistry that has carried over to their work on DC’s Wonder Woman ongoing. Their “Year One” story with colorist Romulo Fajardo Jr. has been one of the highlights of DC Rebirth, and even though it lands in a year full of Wonder Woman origin stories, they’ve managed to offer a fresh, compelling take on Diana’s evolution from Amazon princess to international superhero. Diana is now a public figure after revealing herself to the world by stopping a mass shooting in the last month’s “Year One” chapter, and this week’s Wonder Woman #12 explores how Diana and her companions react to Diana as viral sensation. Rucka has a deep fondness for Wonder Woman lore, and this preview of Wonder Woman #12 has the writer reintroducing the heroine’s classic “Suffering Sappho!” exclamation via her friend Barbara Minerva, who will become the villainous Cheetah in the future. Rucka gives the phrase context that makes it less nonsensical, and also uses it to hint at a potential romance between Minerva and Etta Candy, another member of Diana’s inner circle. The preview ends with a majestic spread that spotlight’s Scott’s and Fajardo’s artistry, presenting Diana and Steve Trevor’s training regimen in one bold visual. Scott’s characterization of Diana captures her grace, strength, joy, and curiosity, and Fajardo’s delicate coloring gives the spread a dreamy quality that heightens the fantasy. 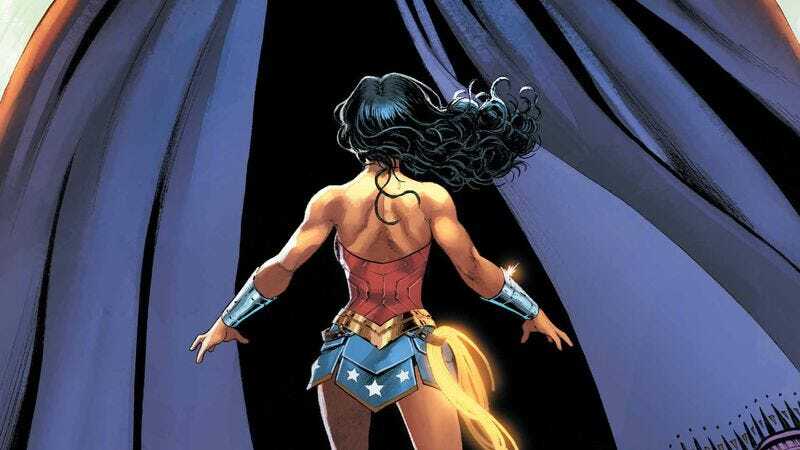 Scott only has two more issues left of Wonder Woman before she leaves to get back to work on the next Black Magick arc, but these final chapters of “Year One” are sure to be breathtaking given the quality of what’s been produced thus far. Image: DC Comics; cover by Nicola Scott and Romulo Fajardo Jr.